Novell Inc. (NOVL US): Chief Financial Officer Dana Russell said customers are delaying some contract signings until they better understand the long-term prospects for the maker of Linux operating-system software. Novell has said it’s reviewing whether to sell itself. Here is a transcript of Novell’s Earnings Call (sliced into three pages), here is an event announcement, and Novell’s press release about its results. UNIX/Linux expert Timothy from The Register has it covered and he goes beyond press releases and fluff sourced from Novell. Whatever drama is going on at Novell in the boardroom — where the company is apparently soliciting takeover offers from up to 20 different prospective buyers — it has spilled over into the company’s financial results. In a call with Wall Street analysts, Dana Russell, Novell’s chief financial officer, said that fiscal Q2 revenues were in line with expectations and profits came in at the high end of the range. Linux bookings were down 3 per cent and Linux invoicing was down 1 per cent in the quarter, with a tough compare because so many Microsoft shops cashed in their SUSE Linux certificates in the year ago quarter. Excluding these Microsoft deals, Russell said that the SUSE Linux invoicing in the quarter was up 46 per cent compared to last year. But that seems to indicate how weak SUSE Linux sales were a year ago and how dependent Novell’s Linux biz is on what Microsoft customers do. Part of the problem is that Microsoft bought SUSE Linux licenses at 45 per cent of the then-current list price in 2007, and at current prices for SUSE Linux support, these licenses are renewing at something closer to 15 per cent of that original value. This makes the compares for the Linux biz doubly tough. But, Novell is optimistic as always. “We are pleased with the growth in our core business,” Russell said. 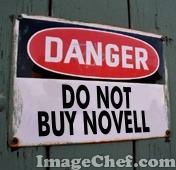 Novell is too Microsoft dependent. Red Hat sells GNU/Linux without this silly reliance on software patents tax and that is why Novell’s future looks neither so promising nor long. There is no reason to buy SLE* anymore. It’s certainly not reasonable to assume that NOVL’s final buyout price will be affected much by the market dropping on a given day. Therefore, on days like this I tend to buy more NOVL. Novell, Inc. (NASDAQ: NOVL) is scheduled to release its fiscal second-quarter earnings after the closing bell on Thursday, May 27, 2010. Analysts, on average, expect the company to report earnings of 7 cents per share on revenue of $204.85 million. In the year ago period, the company reported earnings of 8 cents per share on revenue of $215.60 million. After the markets close, Adaptec (ADPT), Diamond Foods (DMND), Guess (GES) and J Crew (JCG), Novell (NOVL) are among the major companies that are due to release their results. Novell Inc. (NASDAQ: NOVL) posted on Thursday fiscal second-quarter results mostly in-line with the market expectations, while also failing to impress investors with its guidance for the current quarter. Operating costs fell 7 percent to $142.8 million.